MiG-31. A photo. Characteristics. Fighter-Interceptor. MiG-31. A photo. Characteristics. History. Fighter-Interceptor belongs to the fourth generation aircraft. The first flight of MiG-31M held December 21 1985 The aircraft has a few modifications, the difference - in the choice of powerplant, armament, avionics. Aircraft design makes it possible to carry out modernization. The crew consists of two people - a pilot and operator. Powerplant: two turbojet engine with afterburner turbofan D-30F-6, 9500 kg each thrust without afterburner and 15 500 kg afterburner. Creating a new interceptor, the MiG-31 60 began in the late-ies in the Yakovlev Design Bureau. Mikoyan. Chief Designer at the first stages of the design of the aircraft was AA Chumachenko. Later, he was replaced on the post of GE Lozinski. Having position in the development of the "Buran" Gleb Paton replaced Vasil'chenko Konstantin. At the heart of the aircraft fire control system of the MiG-31 is pulse-Doppler radar device with a passive phased array antenna. This aircraft was the first fighter in the world, equipped with PFAR, and remained the only production model with 1981 2000 on till receipt on Rafal weapons. MiG-31 - single interceptor, capable of long-range missile launch by yourself. Also, the fighter is able to capture objects moving at speeds of over 700 km / h.
The chemical composition of the body of the aircraft 50% steel, 33% aluminum alloys and titanium 16%. The aircraft is equipped with modular engines D-30F6 developed on the basis of civil-D 30, which was completed in the Tu-134 (1967 g) with a nozzle and an afterburner. The afterburner chamber of the engine fuel injection method is used "fire lane". When testing the engines was noticed vibrogorenie inside the afterburner. To resolve this problem, install the fifth joint collector. The engine is made of alloys of nickel, iron and titanium. Dry weight of the engine - 2416 kg. The MiG-31 fighter is equipped with electronic warfare devices for infrared and radar ranges. The aircraft is ready to carry out combat missions with the support of an automated ground digital control system (ASU "Rubezh"). The system can perform coordinator support with target guidance and provision of coordinates simultaneously with 4 aircraft, with the distance between fighters can reach up to 200 km. MiG-31 is a one-of-a-kind aircraft that easily intercepts low-flying small-sized cruise missiles. Such abilities make the MiG-31 not an ordinary interceptor, but a permanent combat unit in service in the headquarters of the Air Force and Air Defense. MiG-31 equipped with four missiles and two drop tanks, missiles reset halfway and external fuel tanks at the end of their production, is able to fly away in 3000 3 km per hour 38 minutes. Rocket 4, 2240 km - distance, 2 26 hours min. - Duration. MiG-31BSM - modernized fighter 2014 on the basis of the MiG-31BS podzapravki without rods in the air. The first planes were adopted in defense of 1980 1981 And ​​he began their serial production in Gorky. In the first series was released 2 aircraft, in the second - 3, in the third - 6. Meant for all flight tests. The new fighter-interceptors on arms air defense arrived in 1983 of these models were placed on military bases in Pravdinsk and Savaleyske. MiG-31 replace outdated Tu-128 and Su-15. New interceptors in September 1984 he entered the military base in the Far East - on. Sakhalin ( "Sokol" airport). Series production of the MiG-31 stopped in 1994 500, the more combat units were produced during this time. MiG-31 used during the second war in Chechnya over the airspace of the Chechen Republic. Currently being upgraded interceptors MiG-31BM that are in service, the first two came off the assembly line in 2008 In the same year the government ended the flight tests of modernized aircraft. According to the words of the country's leadership of the Armed Forces, 60-31 Moment will be upgraded to version BM, 40 - modifications to the RS and the BS, 150 pieces. write off from service. In August 2014, after visiting the aircraft building plant in Nizhny Novgorod Deputy Prime Minister of Russia Dmitry Rogozin received a proposal to resume production of the legendary fighter. 20.09.1979, airfield Akhtubinsk - the emergence of a fire engine because of a fuel leak. The plane is completely destroyed. The crew consisting of pilot and navigator ejected. 1984 g, airport "Sokol" (Sakhalin) - two accidents. The first caused the death of the crew, while the second - a successful bailout on the airfield. 20.12. 1988, at the airfield Semipalatinsk - a fire in the left engine and an unsuccessful landing in adverse weather conditions. The death of the entire crew. 26.09.1990, at Monchegorsk - crash after take-off from the loss of the crew. 12.07.1996 g, airport Komsomolsk - during landing with a disabled engine collided with the ground navigation system. The pilot died during ejection. 15.06.1996, at the airfield Komsomol - the death of the pilot due to loss of control over the height. 05.05.2000 city - the collapse of the MiG-31 in the Arkhangelsk region. 01.05.2005 city, Tver region - the MiG-31 came down the runway and burned in a fire. The pilot and navigator survived. 16.02.2007 city, Kazakhstan - wrecked fighter fatal to the crew. 10.03.2010, at the airport Kotlas (Arkhangelsk region.) - During a landing strip on the MiG-31 overturned. Damage is estimated at 86 million. Rubles. The pilot and navigator had numerous injuries. 19.10.2010 city, Perm region - hit the plane in snap state due to technical faults. Wreckage - 60 km north-east of the airfield. The crew ejected safely. 06.09.2011, at airport B. Savino (Perm region) - a disaster within a few minutes after takeoff. The crew managed to save the lives of not. 23.05.2013 city, Karaganda region. - Accident during training flights, the cause of which is considered an engine failure. The crew was able to eject. 14.12.2013, in 26 km from Vladivostok crashed MiG-31D3. There were no victims. 04.09.2014 was - in the course of training did not work the landing gear system. The pilot and navigator were seriously injured, but survived. Gun setup with sextuple gun GSH-6-23M (23 mm). You can use other weapons. The combat load is 9000 kg. Why is not the catastrophe that occurred in 1984 year and which took the life of two wonderful people without which MiG-31 would never exist !? These people are the chief pilot of the OKB named after A.A. I. Mikoyan A.Fedotov (winner of many records and international awards, such as the FAI Gold Medal, test pilot, Hero of the Soviet Union) and test pilot V. Zaitsev. Not to mention these people, mentioning this plane is simply impossible, especially if the name of A. Fedotov, is already mentioned in this article! Also, there are a lot of mistakes or misprints in the article, but both are inadmissible for such kind of sites! A solid resource like the name, too, but such "punctures"? 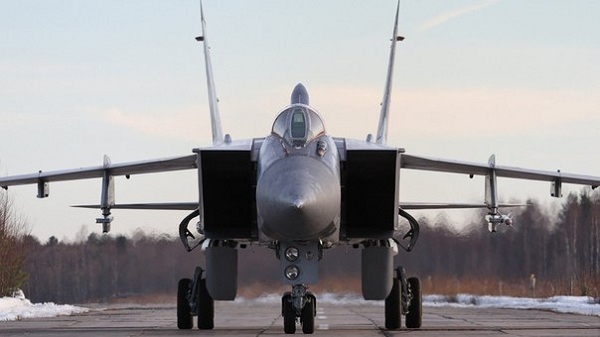 Also, it is not specified, the emergency landing of the MiG-31, which was made by the crew of test pilots V.Menitsky (the aircraft was piloting) and V.Ryndin. I focus on this incident, because this is the only case in the history of landing MiG-31, not only that on the ground (this is not the main thing! ), But also with idle engines! Cases that ended well - there was no more! And here the pilots remained intact (V.Menitsky, after the death of A.Fedotov, became the chief pilot of the OKB) and the plane remained intact, only received minor damage and was quickly restored. Do not describe such a unique case, it would also be necessary. And by the way, in one of the illustrations, MiG-31M is depicted, and the characteristics of the usual 31. Some flaws, amateurish, no offense of course! These models were placed on military bases in Pravdinsk and Savaleyske. Designed based on the MiG-25-31 MiG was created for use in fighter aircraft air defense units. unique SUV (arms control) such as "Barrier" has been specially developed for the new fighter-interceptor. The principle of operation is the simultaneous review of the horizon, accompanied by several purposes and shelling. Using the automatic information exchange equipment for the first time allowed to coordinate the operation of interceptors in a group flight. Even in the absence of full radar monitoring, the complex based on single or discrete information allowed to accomplish the task. Such actions allowed to increase the radius of the monitored space, to redistribute tasks and targets, to transfer data to other MiG-31 groups. In practice, only the "thirty-first" could fire at once for several purposes, effectively hit objects that are moving at extremely low altitudes, including cruise missiles. The collapse of the Soviet Union nearly destroyed the MiG-31 program but still upgrading already existing aircraft continued. Changes in the political environment required to accelerate this work. It is also expected to match in terms of the economic feasibility of re-entry and the subsequent completion of additional number of machines with the full-scale resumption of production of the MiG-31BM. Morane-Saulnier MS.180. Specifications. A photo.